1. Any reason to pass up the standard P-01 and get the Omega version ? I'm not a hard use guy, it'll get shot regularly and may even be carried but no 20k round endurance tests. 2. Is there a steel framed P-01 compact ? or is it internet folklore ? Omega is supposed to have better trigger. Fact, not fiction. And, it is also much rarer. Are the steel framed P-01's not made anymore or just something CZ doesn't really show in their standard "catalog" ? Steel P01 is safety only. IIRC. I liken it more to a 75 compact with a rail. Omega trigger is slightly straighter/ less curved. I think the big draw of the Omega’s is ability to change from decocker to safety. I like my non Omega CZs very much including a P01. Thank You cslinger. Being that I'm only interested in decocker on a DA/SA pistol, the ability to change to a safety easily (Omega version) does nothing for me. Thanks again for the info. I'll post pics when I pick it up. If you want the decocker version then buy the regular P01. Some like the Omega trigger better but others don't. The CZ P07 ans P09 have the Omega trigger if you want to try those out to see the difference. Only other advantage to the Omega I have heard, is that it is simpler to work on. But given your preference for the de-cocker, and the fact that I have never heard of the standard de-cocker failing, I think the standard P-01 makes sense. I prefer the standard P01 specifically because of the decocker and the way it rotates. I have a full sized steel 75 with the Omega trigger. The first DA pull is very heavy compared to my P01 standard DA/SA/ The Omega trigger seems to have a slightly lighter or better single action weight. I need to break out the gauge and compare them. As to supply and demand, I have seen the steel frame compacts in the 700 to 800 asking price range lately. I would highly recommend the standard P01 vs Omega. The location of the traditional (nonOmega) decocker is part of the appeal of the CZ. I have a steel framed "PCR" (no rail, has decocker). Sweet range shooter, but regular P01 better for carry, and darn sweet itself. Get the P01, and keep an eye out for a steel one over the years if you still want, but not a "must have" to enjoy a compact CZ. Both of above have been Cajunized. Well worth it. And, just IMHO, the NSN serialization is not a rare collector's item, but very cool. There is enough variance in the triggers I wouldn't consider trigger pull a factor. Main benefits of Omega trigger is that it's simpler mechanically and also the ability to go either safety or decocker. They do runs of the steel framed P-01 from time to time, it's just a non catalog item. There are a lot of CZ non catalog items they do occasional runs of. First I’ve heard of anyone actually preferring the Omega trigger. There are two all-steel compact P-01 models. The #99041 is labeled P-01 on the slide and it has a steel top end and steel frame (and is otherwise indistinguishable from the P-01) - caveat: it does have a more pronounced upswept beavertail. The #99021 is labeled "CZ-75 Compact" on the slide. Other than the label, it's identical to the 99041 above, including the cool larger beavertail. I owned the 99021 and was smitten with it - sold it on for no bad/good reason at all. the steel reminded me of what CSX uses on its train track rails. 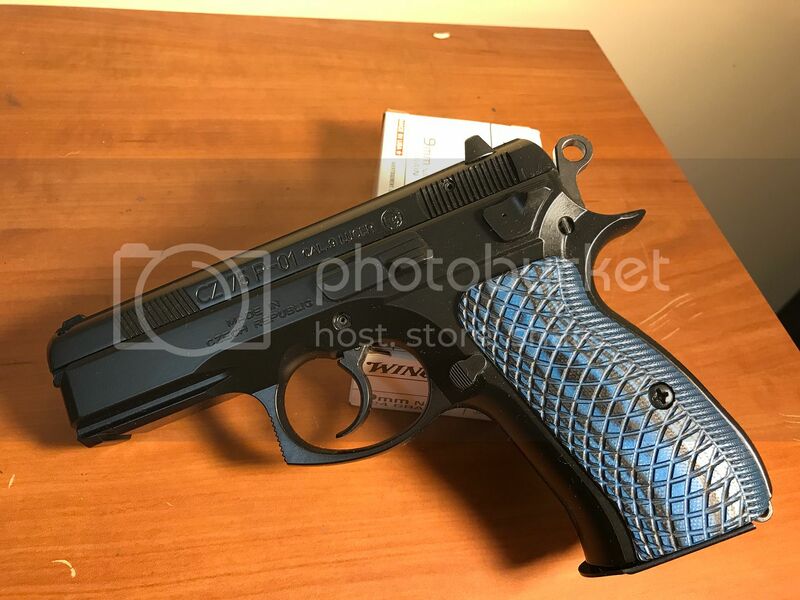 Folklore: rumor has it that the 99021 was produced by CZ under a contract that was eventually cancelled, and the crazy part is someone familiar with that cancelled deal suggested the company was Wilson Combat, who then went to offer the Beretta Brig Tac 92G instead. /\ not sure that's accurate but it is interesting nonetheless. 99041 is easier to find... KYGUNCO gets them in on occasion. With standard trigger it will wear in and they are very good shooters. Right now they appear to be in short supply. Get a regular P01 alloy frame, non Omega. Then go the range and enjoy one of the best shooting pistols ever made. Then order some LOK palm swell grips if you don't love the stock rubber. My PCR has absolutely ruined the Sig shooting experience for me. I've tried getting my Sigs up to snuff with new grips and SRT Kits and while better, they still don't hold a candle to my PCR. I have a steel frame P-01...it's a "tank" for carry. I much prefer the PCR on my hip. I can't comment on the Omega trigger. A trigger job on the the standard DA/SA system is the best I've shot. I have a set of blue Cool Hand grips on mine, no palm swell and run a mecgar flush fit magazine (steel thin base pad) and it is AMAZING how small this pistol feels, yet you still have fighting sized pistol so to speak. Really a great do it all gun. I had her out to the range yesterday and it was a pleasure. I really like CZs decocker location / design on the non omega guns.